Years ago I remember watching a broadcast of The Tonight Show that featured a 90-year-old woman who had recently accomplished the amazing feat of earning her black belt in karate. She came onto the set wearing her full gi and at the end of her interview with host Johnny Carson, proceeded to break some boards with a series of powerful front snap kicks. What I found even more impressive than this woman's physical skills was her lucid demeanor; her mind and resolve were as sharp and sound as her body. Can something like training in the martial arts actually retard the aging process? Exercise has been proven to extend longevity in people. Too much exercise is actually detrimental to health - this too has been proven. Japanese judo coaches found that when their competitors cut down on their previously relentless training regimens, they performed better in matches. The Germans have developed de-conditioning programs for their Olympic athletes because it was discovered that at their level of performance, arthritis and cardiomyopathy (heart enlargement) resulted from the drive for the gold. In a rather disturbing survey, Olympic athletes from around the world were asked if given the choice, would they prefer to relinquish competing and live long or win a gold medal and die young. The majority chose the latter. For them the agony of defeat is a more terrifying prospect than the inevitabilty of death. The Wise Old Man is an idealized archetype in most cultures that dates back to antiquity. In the East, the elderly are generally revered and held as bearers of experience and adepts of skillful living. Examples of this can be found in the martial arts: Aikido founder Morihei Ueshiba and the fictitious Mr. Miyagi from The Karate Kid movies to name two. Some of those stories about the O'Sensei make Miyagi look like a hack and should be taken with a grain of salt. In contrast to his message of peace and harmony, Ueshiba was reputed to be a brutal taskmaster, particularly with his uchi deshi (live-in students). Miyagi made poor Daniel-san perform seemingly endless mundane tasks to develop his character and motor skills. Plus he got alot of nice work done around his yard just for teaching karate. Wise old guys get that way because they've figured out how to deal with the young. I had the honor, last weekend, of attending a bo seminar taught by Sensei Duessel - who I believe is eighty. Sensei Duessel as a man, would be impressive at any age - for eighty in our society, which deems eighty as long past usefulness, he is remarkable in the extreme. One of the reasons I practice internal martial arts, is that they are a physical activity I can continue with into my dotterage. I hope you will excuse the off-topic post, but I was wondering if you could tell me which style of karate the people in the photo are practicing. I noticed that they have their hands chambered at solar plexus height instead of at waist height. I was taught to chamber at solar plexus height in my original martial arts training (shito-ryu), but in almost every other style I've ever seen, punches are chambered at the waist. I've never had the pleasure to attend one of Sensei Duessel's seminars, but I do know he's from the same generation as Advincula, Harrell, et al. Karate in their day was rough - they sparred without gear and frequently went all out. Classes were tough even by marines' standards. His resiliency is a testament to the effectiveness of a lifetime of karate training. Actually, the practice of an internal style might offset dotage. The one that seems to get all the press these days is tai chi. What an inspiring post! Thanks again, John, for keeping me on track while training all on my lonesome. I started Kung Fu in my mid-thirties and in the beginning wished I had done so earlier. Eventually I learned that age, gender etc, are irrelevant. Each individual is their own kind of martial artist with their own particular limitations. What an absolutely inspiring tale to hear of someone achieving a black belt at 90! There's hope for me yet. And as for longevity, I believe it. It's all about balance, isn't it - too much of anything simply is not good for you! Hi John. One of my cousins lived in Okinawa for about three years. She said Miyagi is a very respected name over there, but not because of The Karate Kid. I'm not familiar with that particular book or its author, but I know some of the early 1900s karate patriarchs - Itosu, Chibana, Funakoshi - lived long healthy lives. Not all of them embraced the proper lifestyle conducive to health, though. Isshinryu's founder, Tatsuo Shimabuku, took a liking to filterless cigarettes that undoubtedly contributed to his death at the age of 67. One of the wonderful things about the martial arts is that everyone can benefit from them, regardless of the so-called "limitations" we think we have - which quite often turn out to be blessings in disguise. Yes, the real Miyagi was a very important figure in the development of Okinawan karate. I think one of the best exercises that anyone can benefit from is brisk walking - it definitely contributes to good health and longevity. Wow, I hope I get to live that long. And in good health! Regardless to the activity, docotrs recommend doing 40-60min of daily physical activity once you're beyond 40y.o. It sure can't hurt to do so. I think it's good to know that people who age gracefully doing martial arts are an inspiration. One of the Masters from our organization is up there in age, and she's a 6th degree (probably higher, or working towards something higher). And Master Templeton didn't even start TKD until her 40s! She's also lost a husband, and battled cancer among other things, and always came back to her TKD as the thing that grounded her. She's still going strong, and for me having started at 37, she's definitely an inspriation to me to keep moving on with it. Those karate masters achieved longevity even by modern standards. They probably never omitted daily training, even into their senior years. Apparently the life expectancy worldwide soared during the 20th century. I think some of those figures may reflect infantile deaths into the average - even so, this should be a reminder to everyone how far we've come in the fields of medicine, health care and especially general living conditions. Thanks for the info, Colin. Many people begin training in their 30s and 40s and do quite well. Losing a spouse and battling cancer are enormous obstacles to overcome. Such is the power of martial arts training! I think that the training changes as you age to meet the demands/limitations of your body. I think that you start training with more attention to supporting proper posture, and body mechanics. 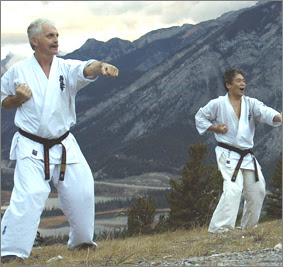 I can easilly believe that the constant training helped the Karate Masters achieve longer life even through the difficult time eras that they lived through. Sensei Gichin Funakoshi also was very careful about what he ate, and watched his diet meticulously.